Look, I know this is a bit of a delayed reaction. In my defense, I’ve been seriously bogged down by things like packing as much of the life that I think I’m going to live in one year, in one and a half suitcases; followed by some serious vacationing in Florida with the in-laws and taking as much of this eternal sunshine in until circumstances take the husband unit and I to Europe for the next year. This response has been brewing inside me all this time, and it hasn’t come out until now because I just haven’t had a moment to write it all down. Or at least, not to my liking. Here’s the thing, because there’s always a thing: no matter what your values may be – left-leaning or not – you can be sure that they’re for sale, somewhere, for a low price…maybe even at Wal-Mart in the music aisle (where, incidentally, you can purchase a censored copy of any Marilyn Manson album). You can be an advocate of anything Al Gore, and you might even argue that his filmed PowerPoint presentation passes as cinema. The point is that no matter how righteous you believe your opinion may be, you probably have it because at some point, it was bought and sold somewhere, which invariably made it available to a larger audience, who could then propagate that view and bring it to various discussions. I’m not saying any of this to discourage people from having beliefs or aligning themselves with particular movements. I’m only trying to illustrate that any opinion, even a good one, is not something you acquire because you’re an original (keeping in mind that I don’t exclude myself from this equation). Ideas are formulated in a constant traffic of incoming and outgoing information, and somewhere in there, your own narrative is formed. That part of it is yours, but the things that feed it are borrowed from a bunch of borrowers. As a result, someone like Kurt Cobain would never have existed without an ample amount of exposure to things that he both liked and disliked. More importantly, he wouldn’t have been successful (to the extent that he was) without the support of a record label. When the “Killing in the name” campaign was launched to boot X-Factor winner Joe McElderry off the number 1 spot in the U.K. singles chart, the motive was to challenge the hold Simon Cowell and his ilk have on the machine that manufactures things like “charts.” I know what you’re going to say: “but Rage said proceeds would go to a charity; but Rage is going to play a free concert in the U.K.” I get it! I’m just saying let’s call this what it is: free press. And with the amount of money Rage already has, it’s a lot like Angelina Jolie donating a cool million to World Vision when she’s worth 100 times that, isn’t it? 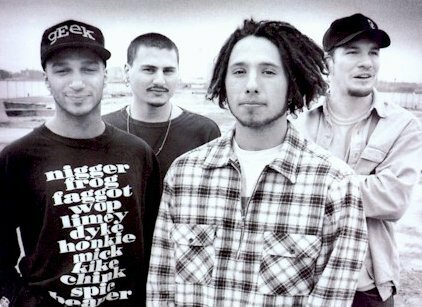 We can’t lose sight of who’s ultimately benefitting from this: Rage Against the Machine. Not you music lovers. Not Joe McElderry. And certainly not today’s alternative musicians, who didn’t get to cash in on the “alternative” movement of the early ’90s the way Rage did. And today’s alternative musicians who are musically talented – but not politically inclined – have to gain their acclaim in a way that’s much more organic than how it was done in those glorious early ’90s. They actually have to play live shows as much as they can (regardless of the venue size), they have to update their own Myspace page, they have to produce as much merchandise as they can because every little bit adds up (and might even pay for gas to get to the next show), and they actually have to reach out to their fans by personally answering e-mails and maintaining blogs and websites. Unless they have the great fortune of being featured in an iPod commercial, today’s alternative musicians develop their fan base in a way that’s probably to their disadvantage, though it’s nevertheless fair: democratically. Most don’t benefit from the marketing mechanics that drive label-backed artists, so they just do it all themselves, amassing fans that like what they do despite a lack of radioplay and advertising. And if these musicians eventually get signed, they still have to keep at it. Case in point: Lady Gaga. Between the two musical acts, I prefer Rage Against the Machine. But I also believe Joe McElderry needs his one-hit-wonder ride more than Rage needs to be on the charts. If anything, sentiments towards “the music industry” are misplaced, especially when Rage is brought into the discourse. In many ways, Rage are no different from Joe McElderry. Without a label, they would never have reached the level of fame that afforded them their fortune (thus allowing them to play free shows). While they don’t have to look like polished pop idols as do most X-Factor winners, you can bet they work just as hard at maintaining their fist-raising revolutionary image. And for alleged leftists, they sure didn’t mind profiting from Che Guevara’s effigy with their “Bombtrack” single (something that would have raised Guevara’s eyebrows). In fact, their leftist construct served them well enough to convince millions of people that a vote for them – a group of signed artists – was a vote against the music industry. Ultimately, the campaign served Rage rather well. It’s a shame because Rage stole votes from a working-class boy who needed your help more than they do. It’s odd, considering what Rage writes about. You’d think they might have stood up for a working-class hero themselves. More importantly, the exercise proved how easily it is to sway the public to do anything. I don’t care how this impacts the musical charts, but it’s sad to admit that this happens all too often in the political arena. In that light, I’d like to throw the following out there: instead of voting “against” the person we don’t want, why don’t we make an informed choice about the person we want to vote in? 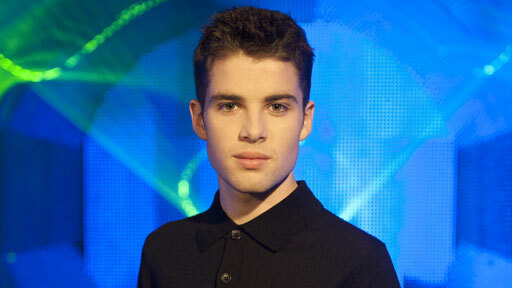 Don’t stand behind Joe McElderry or Rage Against the Machine. Support the person who hasn’t been signed yet.